The management of articular cartilage lesions in the knee provides a significant challenge to the orthopaedic surgeon. These injuries have limited healing ability. On a cellular level the goal of treatment is to regenerate normal ‘hyaline’ cartilage within the defect with a similar structure to and similar properties. The aims of treatment for articular cartilage defects include the provision of symptom relief, improvement of function and an attempt to delay progression, in the affected joint, to more extensive osteoarthritis. A number of therapeutic strategies have been employed in an attempt to enhance healing of such lesions. 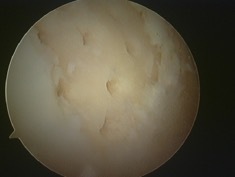 Cartilage defect on medial femoral condyle. Estimates of the incidence of significant chondral injuries from arthroscopic series vary widely. It is unlikely however that these series represent the true incidence of these lesions in the community as many lesions may not produce symptoms and the affected patient may not seek treatment. The key questions of which lesions heal and which progress have only partially been addressed in the orthopaedic literature. It is important before embarking on a treatment program to define the treatment goals whether palliative, reparative or reconstructive. The key to obtaining a successful outcome in the management of osteochondral injuries is appropriate patient selection. As with the assessment of any orthopaedic condition this should include a thorough history and physical examination. Physical examination must address both the involved knee and associated structures. Particular attention should be paid to the alignment of the limb as patients with normal alignment will tend to respond more favorably to treatment than those with large deviations. Issues such as obesity, gait abnormalities and co-morbidities that might prevent a patient from following prescribed postoperative protocols should be identified. Previous clinical records and imaging studies including arthroscopic views of the lesion should be obtained where possible. An assessment should also be made of the patient’s expectations, goals and likely compliance with rehabilitation protocols. The patient must be fully counseled regarding the treatment options available, their specific risks and the likely outcomes of each course of action. The ideal candidate for the majority of the procedures discussed is the symptomatic younger patient with a traumatic, small, focal lesion with no significant bone loss or associated ‘kissing lesion’ on the opposite articular surface. Ideally the surrounding cartilage should be normal and the menisci (knee cartilages) should be intact. Reasons for not being able to perform a cartilage regeneration procedure include significant malalignment, inflammatory arthropathies, extensive degenerative disease and factors such as problems in the opposite limb that would prevent adherence with rehabilitation protocols. X-rays are a poor predictor of the degree of joint surface degeneration. Nevertheless X-ray can be used in order to assess alignment abnormalities and additional pathologies. Magnetic resonance imaging (MRI) is currently the modality of choice for the detection of acute and chronic osteochondral injuries. It may be used to define lesions and monitor treatment. Improved resolution and new imaging techniques have allowed for a more accurate assessment of these lesions. The gold standard for grading the degree of osteochondral damage however is direct visualization and probing of the lesion at arthroscopy. Arthroscopy allows the surgeon to accurately map the location, depth and size of the defect in addition to making an assessment of the quality of the surrounding articular cartilage. These procedures include abrasion of the lesion, drilling of the base of the defect and microfracture. The underlying principle of this group of techniques is to surgically penetrate the subchondral plate to allow the ingress of stem cells into the defect. It is hoped that these cells will differentiate into chondrocytes and initiate hyaline cartilage production. During microfracture the lesion is carefully prepared arthroscopically (via keyhole surgery). Specially shaped awls are then used to penetrate the subchondral bone. The procedure generally has a low complication rate. The goals in the postoperative period are to protect the initial clot that is formed in the defect and encourage the production and maturation of durable repair tissue. Early passive range of movement exercises are usually initiated in the early postoperative period. Protocols may vary depending on the size and location of the lesion. Microfracture appears to give better results in the younger patient with a small traumatic lesion. This may be as a result of the higher number of pluripotent stem cells in the younger patient and the relatively normal surrounding tissue that is usually present in a traumatic rather than degenerative lesion. Enhanced microfracture techniques using a variety of scaffolds (such as Chondrotissue grafting) can be used in the treatment of larger lesions and are showing promising results. 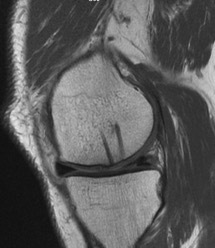 Post-op MRI showing new cartilage formation after enhanced microfracture. These techniques involve the insertion of ostochondral (cartilage and bone) autograft (from the patient) or allograft (donated from another patient) plugs or articular segments into the joint surface to restore normal joint congruency. Both techniques allow single stage reconstruction of the joint surface. Autograft plugs have the advantage that there is no risk of disease transmission and that they remove the logistical difficulties of using allograft tissue. Disadvantages include limitations on the amount of tissue available, as grafts should only be taken from non-weight bearing areas of the knee and potential donor site morbidity. Allograft material provides a potentially unlimited amount of reconstructive tissue and has the advantage that there is no donor site morbidity. 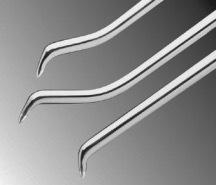 Well-matched grafts can provide a ready contoured surface. However, a number of additional considerations such as cost, ethics, cell viability, immunogenicity and disease transmission come into play. These procedures are usually technically demanding. The postoperative rehabilitation is usually similar in nature to that employed following microfracture. The goals are to maintain movement while minimizing the shear forces experienced by the plugs or allograft. Longer periods of restricted weight bearing may be chosen (3-4 months) to assist plug or graft integration. These techniques have been reported to give good to excellent both in isolation and with ligament reconstruction in suitably selected patients. Similar techniques using synthetic plugs have produced mixed results. 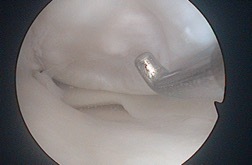 In this group of procedures chondrocytes (cartilage cells) are harvested from the knee using an arthrscopic technique. The harvested cells are then isolated from the surrounding cartilage matrix and resuspended in a culture medium. The tissue is then cultured until sufficient chondrocytes are available for implantation, a period of between 2 and 4 weeks. The second stage involves preparation of the defect through a small incision to obtain a healthy, stable cartilage margin. The chondrocytes are implanted either alone and held in place with a periosteal membrane or inserted as part of a biological matrix. Rehabilitation is generally commenced 6 to 12 hours after surgery. The outcomes of these techniques are determined by a number of factors. Younger patients with smaller lesions in particular have improved clinical outcomes compared to those over the age of 40 at the time of surgery. Lesions in certain areas of the knee seem to do better than others. The principle concern in attempting to regenerate articular cartilage is failure to achieve filling of the defect. In addition to general rare complications of arthroscopy such as infections and adhesions, reported complications of chondrogenic tissue transplantation include graft hypertrophy, loosening and instability of the retaining membrane. Allograft infection, although rare, has been reported. Non union of osteochondral grafts or collapse may arise due to poor revascularisation. The key challenges for the future are to enhance the quality of the regenerate cartilage. In microfracture techniques this will be by ensuring good clot adhesion. This will require the development of improved techniques for delivering growth factors and for the introduction and adhesion of scaffold to enhance tissue ingrowth. Tissue engineering techniques will continue to develop to address the production of an appropriate matrix scaffold, the delivery of an appropriate cell population and the introduction of signalling factors to guide cellular differentiation and function. Developments in chondrogenic transplantation will include the use of allogenic, bone marrow derived or fetal stem cells to negate the need for a two-stage procedure involving chondrocyte harvest.